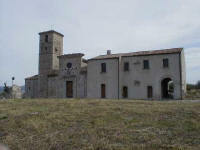 uly 13th, 1614 Monsignor Eustachio, the Bishop of Larino, took a trip from Casacalenda to Morrone. During this trip he underwent great sacrifices due to a severe fever. Furthermore, being it July, Monsignor Eustachio had to cope with the intense heat of the summer months. The importance of the pastoral visit lied in Eustachio’s evaluation of whether or not the clergy had properly applied the decrees of the preceding year. But above all, the pastoral visit was made to plan the Sinodo Diocesan of 1615, which Monsignor Eustachio saw as the indispensable means for the re-launch of the pastoral mission and for the application of the teachings of the Council of Trent. The presence of the clergy in the diocese is quite numerous: 186 people, among which there are priests, clerics and deacons – without counting the religious orders. The visit was also necessary to directly verify the moral and material conditions of the 14,000 souls to which he is entrusted. Monsignor Eustachio had a great spiritual guide that inspired him; Carlo Borromeo, the Bishop of Milan, is a man that influenced Monsignor Eustachio so much that he helped work out the model of the pastoral visits and the visits of the Sinodi Diocesani. As soon as Monsignor Eustachio arrived in Morrone and exited his carriage that was swarmed by faithful, Monsignor Eustachio was welcomed by the clergy, the archpriest don Marco Egipsio and by the feudatory, the Duke of Telese. Accompanied in the parochial church of Santa Maria Maggiore, Eustachio recited the prayer “pro visitatione incipienda”, celebrated the mass and received the act of obedience from the clergy. He invited his co-helper, don Paolo Squillante, to note down in minute detail what will be discussed, in order to have a principal topic for both the Sinodo and for the decrees that will be sent to each parish. In the church of Morrone, as in other towns, recommendations are given on the cleaning of religious objects and sacred vestments, and the conservation of the holy water. Interventions requesting specific economic needs are often mentioned as well. For example: the baptismal fountain is cracked and is leaking water; the bell tower doesn’t have a door and the side door of the church is broken; the relics are kept with care, but the window that conserves them is not closed; the cemetery does not have a gate. is seen in the other churches of Morrone. The doors of the church of San Giacomo are never closed at night as well as the ones of the church of Sant’Angelo, the grange of the abbey of Casalpiano. Upon entering these places the aforementioned negligence becomes self-explanatory. Continuing on with his visit, Monsignor Eustachio went to the countryside and summoned entire communities to the abbey of Santa Maria di Casalpiano. He took this opportunity to remind the clergy of its obligations to the rural population, the segment of the social strata that historically has been among the most neglected. poverty many times during his visit, making light also of the eight Albanian villages that according to the Greek rite are not parochial and therefore cannot collect annuities. On large farms and rustic feuds, Albanians lived literally in “hay” and didn’t enjoy much other than sporadic contacts with towns. Their priests were all from the Orient (or consecrated by an eastern bishop) and for this reason Monsignor Eustachio asked Il Collegio Romano to accommodate some Albanian students. 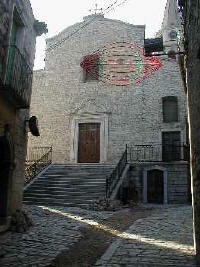 The roof and the sidewall of the church of Casalpiano are partially destroyed. The adjacent chapel of Sant’Orsola does not have a door and does not house any sacred images, objects or vestments. His call to the charity of the faithful fell on deaf ears, however, because of the overall shortages and poverty of the time period. But the Bishop was obligated to impose upon the parish and the abbey the problem of pledges because of the confiscation of annuities. This was a threat that Monsignor Eustachio repeated in numerous villages; in effect the clergy was in a morally bankrupt state and it was more dedicated to fund-raising than pastoral benefits. Almost all of the churches were without new missals and very few supplied the Piccolo Cathechismo. The Piccolo Cathechismo was written in Italian by Cardinal Roberto Bellarmino, a man that deeply respected Bishop Monsignor Eustachio and was the Cardinal that consecrated him. Continuing on with his visit, Monsignor Eustachio went where all of the old churches – which now are all destroyed and abandoned - once were, and he erected a cross in their memory: San Rocco, Sant’Angelo, in the outskirts of the town gate; Santa Maria Maddalena; Santi Marco e Nicola; San Vito, right near the antique monastery of San Roberto. Lastly, he visited the church of San Giovanni delli Rossi, which he threatened to demolish so that he could ask for a complete rebuilding and restoration of it financed by the abbey. The visit concluded with the grande festa della Cresima but make no mistake, the Bishop did not leave happy. Even if Monsignor Eustachio was part of the Congregazione dell’Oratorio - founded by San Filippo Neri, the beacon of Christian optimism - he had a medieval temperament that pushed him towards continual sacrifice and the embracement of suffering. This embracement was the cause of his pain, his infections and his constant fevers. His faith grew from his pain and he carried out a complete adhesion to the teachings of Jesus Christ and his sacrifices. As a result, his brief permanency in the Diocese -a mere 4 years – faced tough opposition. In the Episcopal court, he dedicated himself to standing firmly against renunciation. As regards poverty, he preached that it was an evil that encouraged incomprehension and distrust. Furthermore, Monsignor Eustachio could never be at ease with the clergy, whose laxity, in his opinion, contributed to a growth of heresy in particular dioceses, specifically rural ones. Monsignor Eustachio, however, instead of giving in to the administration – something that in every age has been easy to do – chose to struggle. At the very end of his life he chose to return to oratory and give back his Episcopal ring.